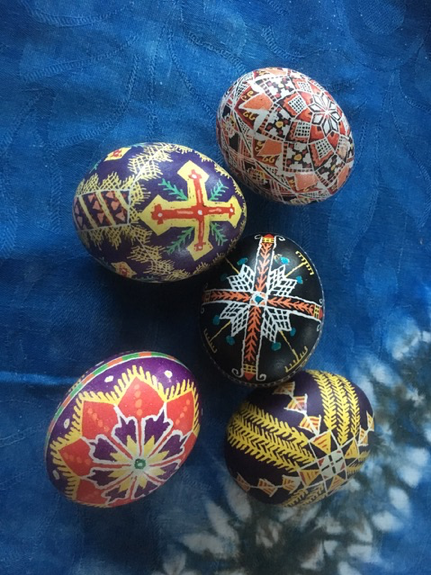 Pysanky eggs are Ukrainian Easter eggs, decorated with traditional Ukrainian folk designs using a wax-resist method. The word pysanka comes from the verb meaning, “to write” or “to inscribe”, as the designs are not painted on, but written (inscribed) with beeswax. This process of decorating eggs can be a contemplative practice with multiple symbolic meanings in the season of Lent. Please join us for one or more Fridays in Lent to create your own Ukrainian Easter egg. You are welcome to join the community for Morning Prayer in the chapel at 8am. Instructions will be given each Friday at 9am. The process is easily introduced so that you will have most of the day to work on the design of your choosing at your own pace. Depending on the intricacy of your design, an egg can be completed in one day or you may choose to work over the course of several Fridays. Contact David Wenger for more information.